Keep up the great work everyone. The petition continues to grow and word is spreading far and wide about the #EndTheVeto campaign. If you haven’t already signed the petition you can follow this link. Support is pouring in from across Northern Ireland, Ireland, the UK and across the world as the campaign nears 4,000 signatures. We are asking everyone who has already signed to get all of their friends and family involved in helping to spread the word. Each signature of support makes a world of difference. Last month, the online anti-homophobia campaigning platform STOP-homophobia joined the campaign. The petition is currently being broadcast daily to over 200,000 Twitter Followers and over 730,000 Facebook Fans to raise awareness of the campaign on a worldwide stage. Prominent human rights activist Peter Tatchell last week added his support for the campaign. “Blocking does not encourage discussion and debate, which are the corner stones of a democratic society” he added. Alliance party LGBT member Micky Murray had this to say about the petition and the journey towards equal marriage in Northern Ireland. The run up to the election is an ideal time to highlight this issue and show the Democratic Unionist Party that they will not go unchallenged on these actions any longer. See the image below this post to see some of the words, phrases and campaigns associated with past and present members the DUP to get a gauge of what has already been swept under the carpet and dismissed. Petitions have been signed on this website in relation to marriage equality in Northern Ireland before but on this occasion we are asking everyone to say enough is enough and stick with us to keep up pressure on the DUP to deal with this issue. Thank you to everyone for the support and please do whatever you can to encourage more signatures on the petition. 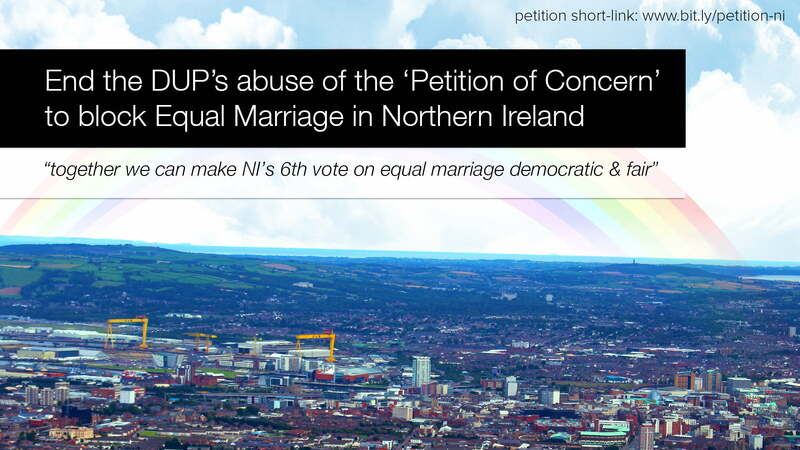 In the meantime you can tweet the campaign at petition_ni and we’ll bring you more updates soon.